Denim-on-denim maaay or may not be one of our favorite timeless trends. We’ll give you a hint: it definitely is. We’re obsessed with all things denim. Denim tops, distressed denim, denim jackets, colored denim, denim accessories (okay, okay, we’ll reign it in). Stepping out in a full-on Texan Tux may strike fear in the hearts of some, but we’re here to make a strong case as to why this fashion flashback is the must-try trend of the season. With these crucial dos and don’ts, you’ll be a double denim pro in no time. >While double denim may conjure up the image of an ultra-casual ensemble, when you try it out with a denim skirt in a sleek pencil silhouette, your look can easily transition from day-to-night all while looking put-together and polished. Ensure that your denim is at least two shades apart. Unless your ensemble is part of a coordinated set, it can quickly go south trying to correctly piece together a monochromatic look. Doubling down on denim doesn’t always have to mean blue on blue. Tonal mixing with black and grey is the ultimate incognito introduction to trying out this style in stealth mode. Seek unique elements that give your ensemble a one-of-a-kind, vintage-find feel. Denim with embroidery, embellishment, or unique distressing will truly set your look apart. Pro-Tip: Choose one piece to be the focal point of your get-up to refrain from going over-the-top. Once you feel comfortable taking it up a notch, try experimenting with exaggerated (but balanced) silhouettes. Opt for a denim duster paired with tailored skinnies, or pair a fitted top with relaxed boyfriend jeans. 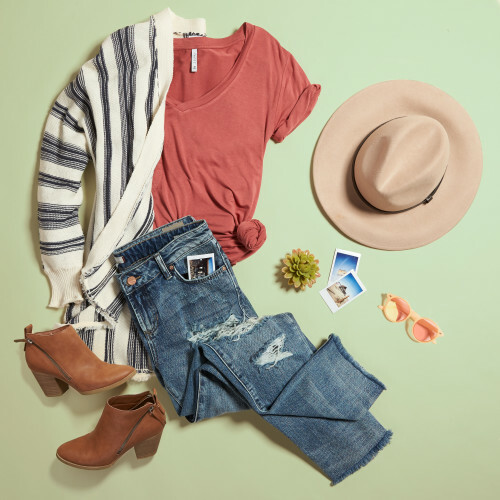 If you’re not ready for a denim ensemble from head to hem, punctuate your look with a solid tee, striped sweater, or printed scarf. Adding different textures or patterns breaks it up while remaining casual and classic. We adore the effortless and care-free nature that is denim-on-denim, so it’s best to keep things simple. Try not to mix too many of-the-moment trends in one outfit. Is there anything that brings in the new season better than a pair of crisp white jeans? Okay, maybe the smell of flowers in the air and later sunsets are pretty great too, but we love white denim as the foundation of an amazing outfit. 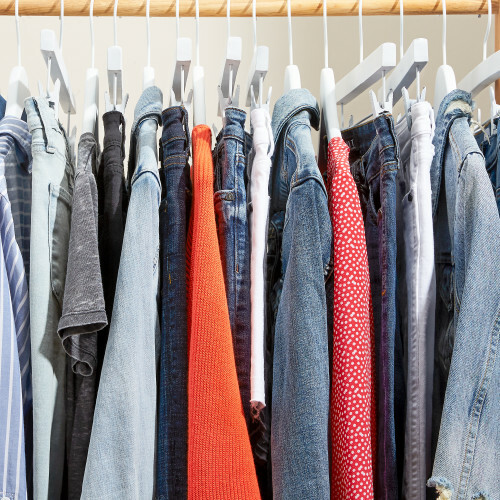 While you’ll have to wait until after Memorial Day to wear them because of very strict fashion rules, it’s great to prep your closet ahead of time. (Um, we’re totally kidding. Break those babies out any time you’d like–rules, schmules. We’d wear them 365 days a year if we had enough pairs.) 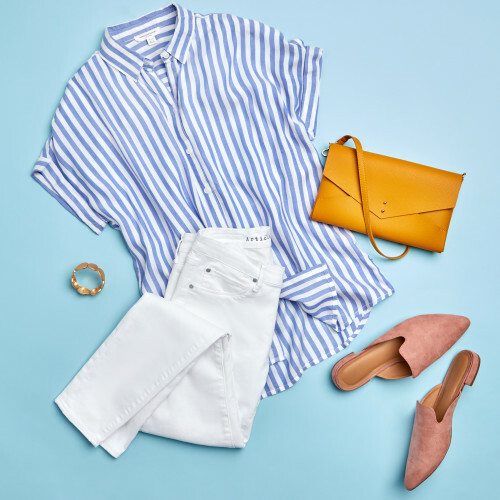 Take a peek below at a few of our Stylists’ favorite ways to wear white jeans. White denim is as versatile as a black trouser and a great way to refresh your work wardrobe. For an office-ready ensemble, pair your white jeans with a floral cami and a pretty blazer in a pastel hue. We love the attention to detail on a great camisole. Eyelash lace trim or a scalloped hemline can really elevate an otherwise simple piece. 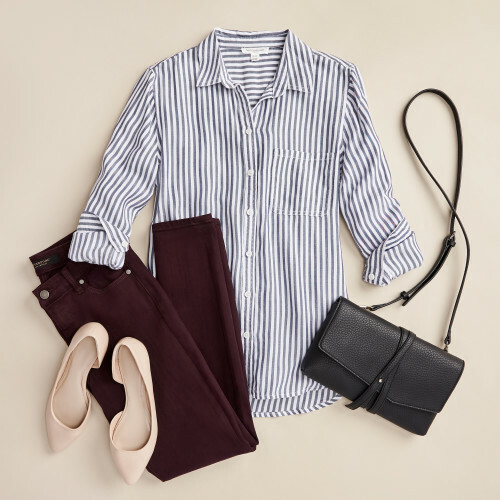 With an outfit this good, you’ll have the confidence to slay the work day. Wearing your white jeans with your go-to denim jacket is the incognito way to wear denim on denim if you’re not a fan of wearing head-to-toe indigo. Finish your look with eye-catching stripes. It’s the perfect way to try out pops of neon–one of the biggest trends for spring–without going overboard. Take it one step further and finish your look with bold accessories for some extra wow factor. For on-the-go plans, give your blue jeans a break and swap them for white denim for an instant outfit update. Paired with an elevated sweatshirt, you’ll look put-together and still feel comfortable as you hustle around town. Round out your look with slip-on sneakers and a crossbody bag, and you’ll be ready to take on your day in style. St. Patrick’s Day is just over the rainbow–er, right around the corner–and we are so ready to get out and celebrate after this 18-year-long winter. Whether you’re heading out to watch a parade with family or kicking off the weekend with friends, you may find yourself wondering what to wear. Before you reach for a kelly green boa or festive shamrock shirt, we’ve put together 5 looks with a *pinch* of green that won’t leave you looking like a leprechaun. While we can’t offer you a pot of gold, you’re sure to hit the jackpot with any of these fashion-forward green outfits. It’s easy to get your greens when camo continues to conquer the fashion industry. Wearing varied shades of olive is the toned down way to do St. Patty’s Day if you’re not into wearing vibrant colors. Cool camo skinny jeans and a utilitarian backpack paired with a trendy tee is an effortless outfit you’ll wear way past March 17th. We love a soft shade of pistachio combined with a swingy silhouette. 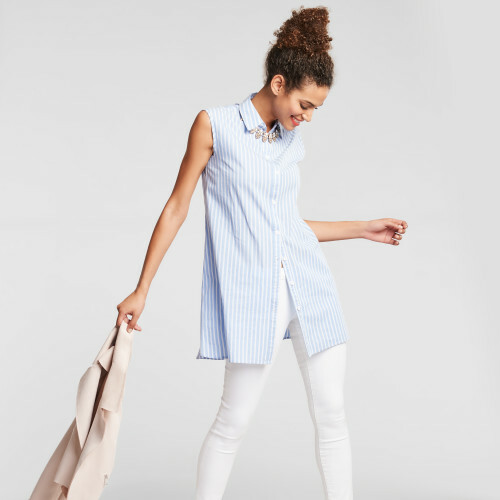 It feels sweet without being over-the-top and is a great transitional outfit for spring. Pair a breezy tank with straight leg denim and sneakers for a totally relaxed look. You’ll feel comfortable no matter where the festivities take you. If it’s still a little chilly where you live (residing in Milwaukee, we can 100% relate), throw a lightweight jacket on to keep you warm. Spring florals are an easy way to turn heads and make your friends green with envy. A lightweight blouse in sage green is a great way to sport the playful pattern on St. Patrick’s Day. You’ll easily be able to layer it if needed or pair it with shorts and sandals if the temperatures allow. A crossbody bag is a perfect companion for celebrating a holiday. All of your favorite belongings will be easily accessible, and your hands will be freed up for all the toasts you’ll be making with your Insta-worthy green drinks. Wear vibrant skinny jeans in a mint hue—you’re sure to stand out against the sea of basic emerald outfits. This dreamy hue makes us think of tasty Shamrock Shakes–yes, we know they’re as controversial as candy corn–without being the typical shade of four-leaf clover green you’re used to seeing. Round out your look with a striped tee and lace-up sneakers for a cool and casual look. Simple yet chic green outfits can be tricky to pull together, but soft shades of green paired with a crisp white denim jacket is a look that definitely gets our (Irish) blessing. With fresh seafoam stripes, you’ll be safe from all of the St. Patty’s Day Pinchers. (How did that become a thing, anyway?) Finish your outfit with indigo jeans and slide on loafers for a slightly preppy vibe. Trying to master long-weekend packing is usually a lot easier said than done. Even though a weekend getaway means only a few short days spent away from home, trying to come up with a few travel outfits that conveniently fit into a weekender bag is no easy feat. If you love clothes as much as we do, it’s challenging to decide which pieces make the cut. 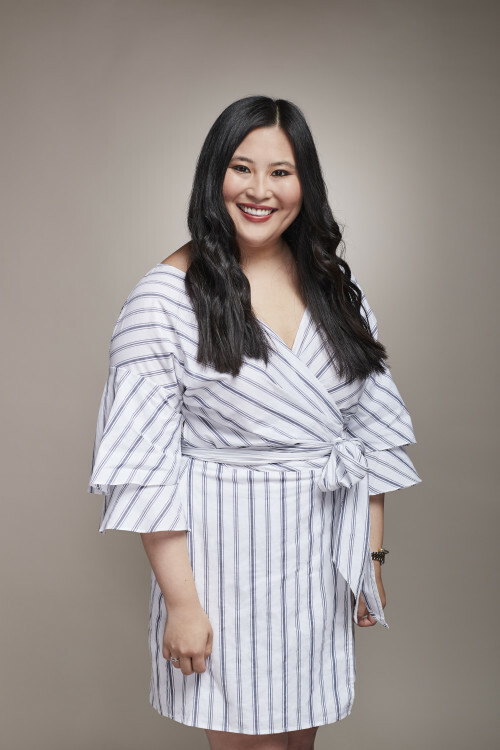 As tempting as it may be to pack that top that’s been sitting in your closet for 5 years (even if you swear this is the perfect occasion), the key to smarter packing is versatile pieces. We’ve created a list of 7 essential items to help you strategically plan your travel outfits (so you can save space for allllll the shoes). The mix and match options are endless! A quick trip out of town means making the most out of each piece you bring with you. A vibrant button-up is easy to dress up or down, making it a must-have item to add to your list. 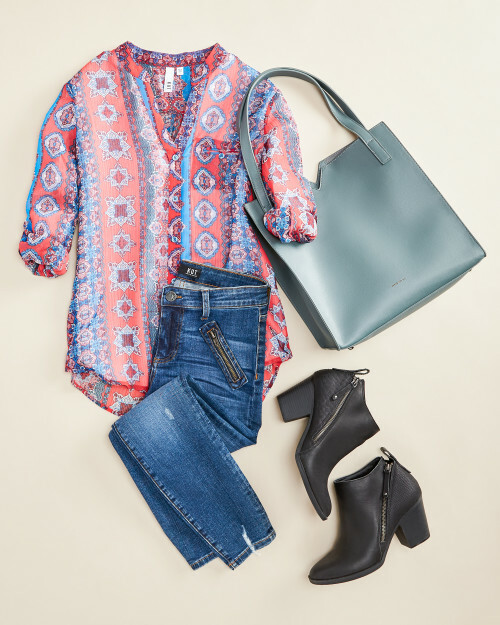 Paired with medium-wash jeans, an oversized tote (perfect for stashing all of your travel essentials) and low-heeled booties, you’ll be prepared for whatever the day throws your way. No matter what your plans entail, you’ll probably need a more casual ensemble at some point during your weekend getaway. 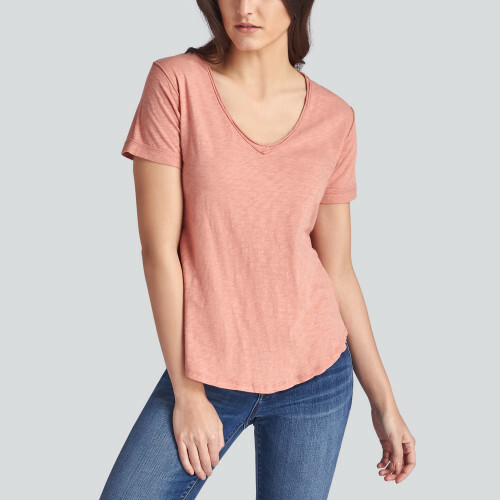 Try pairing a long sleeve tee with your blue jeans and some comfortable sneakers. This low-maintenance look works just as well for a laid-back day sipping drinks on a patio or spending the afternoon exploring a new city. If the weather allows, a long sleeve tee with striped linen shorts will be your best bet for your travel outfit. Whether you’re sitting for hours in a car or on a plane, you’ll feel comfortable without looking like you rolled up in your PJ’s. Plus, it’s a polished look that allows you to hit the ground running as soon as you arrive. Having to remove your shoes for TSA or fuss with them at each rest stop (Who else always kicks their shoes off in the car? 🙋‍♀️) can be a pain, so wear slip-ons for added convenience. It’s always fun to get innovative with your travel outfits, so don’t be afraid to mix and match unexpected pieces. Layer the long sleeve tee over a floral dress for a make-shift skirt ensemble. To make sure your outfit looks cohesive, add a belt and French tuck the sweater into it (Tan France would be proud) for a more tailored look. Choose a shoe that feels right for your agenda. On your feet most of the day? Go with a sneaker. Heading out to dinner? Throw on a bootie for instant wow-factor. A classic denim jacket is *the* go-to piece when you need to pack light. You’ll be able to pair it with everything you’ve squeezed into your weekend bag giving you plenty of outfits to choose from. It looks especially amazing layered over a lightweight floral dress for a breezy and comfortable look. Keep it casual with sneakers during the day or elevated with booties for an easy evening transition. 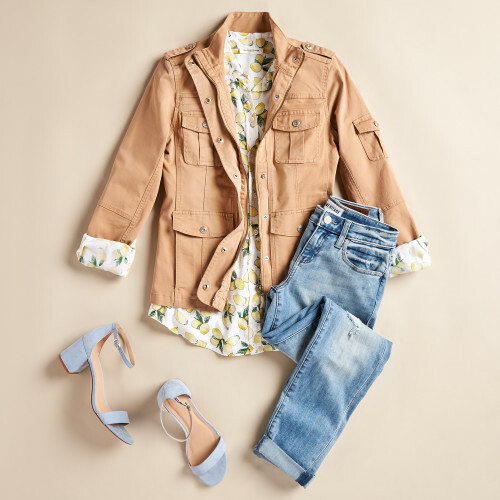 Let’s face it, we’ll forever be shipping denim-on-denim, so try the jacket with the button-up blouse and blue jeans for a broken up Canadian Tuxedo. The pairing options are limitless for this versatile piece so you don’t have to waste precious cargo space by packing multiple jackets. If you’re looking to dress up this casual ensemble a bit, throw on a bootie or pointed flat for added sophistication. This International Women’s Day, we’re celebrating strength, individuality and so much more. 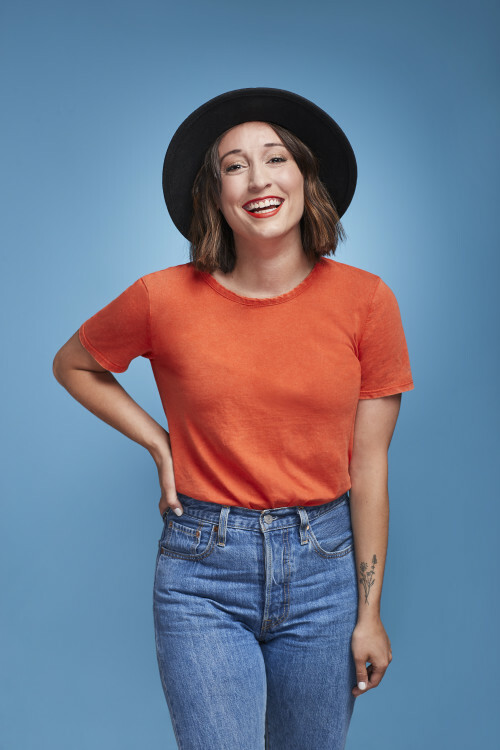 We’re here to provide women with tools for confidence and self-expression so they can feel like the best and most comfortable versions of themselves. And as women in the business of empowering other women through personal style, we say “thank you, next” to one-dimensional depictions of our gender. Like you, the women of Wantable are many things: career-driven, family-oriented, independent, creative, the life of the party, bookworms and everything in between. We’re lucky to be surrounded by a team of talented, strong women, and wanted to share the stories of a few team members who are in pursuit of their passions outside the walls of Wantable. We hope you’re as inspired by these individuals as we are. Watch out for this triple threat–she can sing, act and dance! Emma started acting as a kid but really found her passion for it in high school. 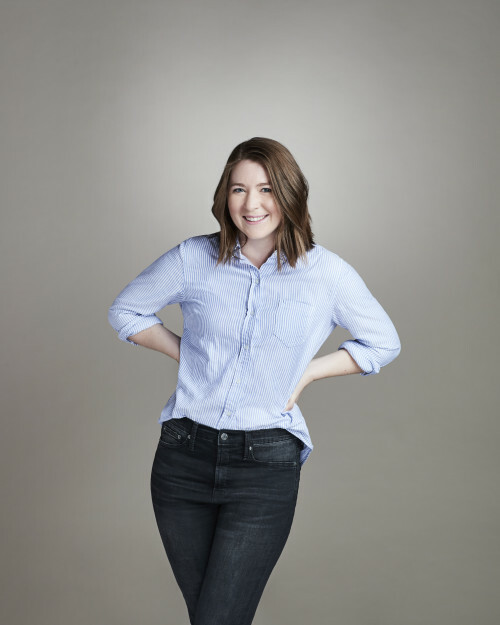 She declared Theatre as her major in college, and with the help of a supportive professor, knew it was a career path she wanted to stay on. 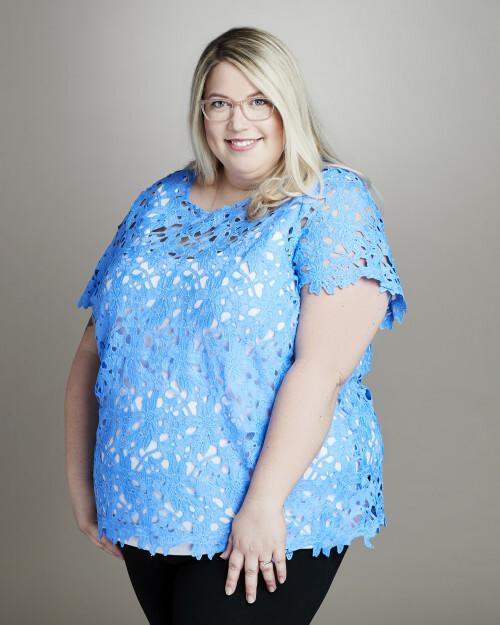 Between rehearsals for her most recent role as Cinderella in Disenchanted and working as a Stylist, we caught up with her to hear more about her journey. What is your favorite show you’ve ever been in? A Street Car Named Desire. It was the hardest, most rewarding thing I’ve ever done. At the same time, it was the moment I felt like I had really developed as an actor. It’s a classic play, but it contains tough subject matter that we wanted to bring to the forefront. I had well over 600 lines, 4 pages of monologues, and was on stage the entire time. It was a physically and mentally exhausting show. What does the typical audition process look like? It depends on if you’re auditioning for a specific show or doing a general audition. A general audition means that there are multiple theatres and you audition for them all at once. After that, they contact you if they want you to be in a show for them. I think I prefer auditioning for a specific show because then I can pick my audition material based on the style of the show or the characters. Typically, you have less than 4 minutes to make an impression! What advice would you give to someone looking to start an acting career? It’s the people that work the hardest that make it. There are a lot of very talented people out there that won’t make it because they don’t put in the hours and dedication. I also think there’s a stigma with acting that you’ve only made it if you get to New York on Broadway, but that’s not the case. You can succeed in all kinds of places! The fact that I get to do it at all is amazing. If I get to do it for the rest of my life I’ll be super happy no matter where that may be. 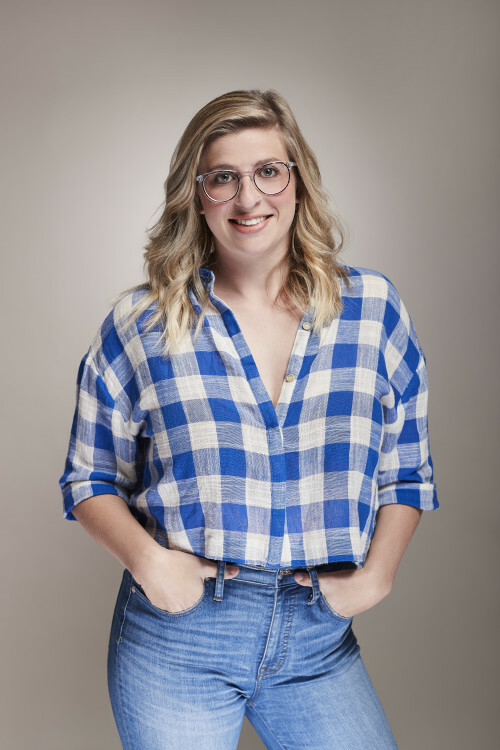 Lauren is a multi-talented artist who specializes in wedding photography and also happens to make (and sell) killer embroidery. From the moment she got a point-and-shoot camera at the age of 12, she’s had a passion for photography and it’s only grown from there. After completing a Photography degree in college, she’s traveled the country as a wedding photographer heading to amazing places like Chicago, Phoenix, Colorado, California and of course, Milwaukee. Be sure to check out her amazing photography and sassy embroidery for a closer look at her incredible talents! How did you get started photographing weddings? I originally thought I was going to do fashion photography and have always thought it would be so cool to travel and follow a band around, but then I got asked to do a wedding and fell in love with it. Now, I’ve been doing wedding photography for almost 6 years! I was located in Chicago but was hired for a wedding here in Milwaukee and relocated 3 years ago. How would you describe your embroidery? Sassy needlepoint. I got started with embroidery because I wanted to make a joke cross stitch for my dad, which is now hanging in our house. From there, I started working on pieces that were unique and tend to include a lot of puns. I love checking out the hashtag #modernembroiderymovement because it’s a large community that shares my passion. What would you say to someone who is looking to start their own business? Make sure that you’re finding a balance. You’re hopefully starting a business because you have a passion, there’s a problem you want to solve, or there’s something you want to create. Be sure to balance the creative aspect and the business side, because you can’t succeed without both. Every day, Lauren balances mom duty with manager duty. She inspires her team of Stylists daily with her positive attitude, and we love her refreshing outlook on motherhood. And, if we’re being honest, her 2-year-old daughter Olivia is a style icon for us ladies at the office–her wardrobe is that adorable. Aside from talking about little Olivia’s custom-made closet (jealous), we were lucky enough to learn some of her best advice, tips, and tricks from her experiences as a mom. What’s been your favorite part about watching Livi grow up? In general, being a mom is amazing. It’s been a life-changing experience for the better. Olivia is so full of joy, and she really shows me a lot of new perspectives on life and makes me want to be a better person. I love our mommy-daughter dates like going to lunch or going shopping. My dad made a custom closet for her, so I love filling it with clothes that look like something I would wear. I’ve never been into baby clothes, and really love the trendy clothes for kids from places like Zara, Nordstrom and Baby Gap. How do you go about balancing work and family life? For me, I always put Olivia first. But, I think it’s important to keep your friends close and make time for things that are important to you. I’ve made great friends at Wantable, so making sure I make time for them is important to me. Sometimes people have mom-guilt for going out with friends, but at the end of the day, everyone needs a break and you deserve it. What advice would you give to a new mom? For any mom, just take a deep breath. You’re going to be okay no matter what. Just do whatever you think is right. When I was pregnant, I would read a lot of blogs, and there are so many opinions. You just have to do what feels good and go with your gut. Something that may work for you may not work for somebody else and vice versa. 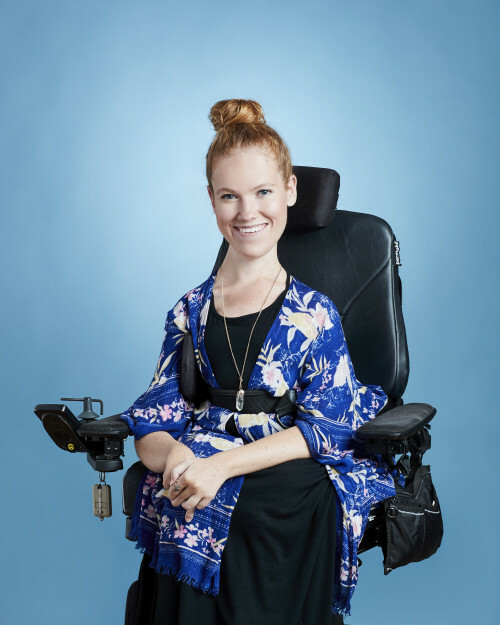 From the age of 6, Haley has been attending an annual summer camp run by the Muscular Dystrophy Association. After falling in love with attending camp, she became an active member (and President!) of an amazing organization called With a Little Help. Her constant dedication to spreading awareness and recruiting more camp-goers is truly an inspiration. 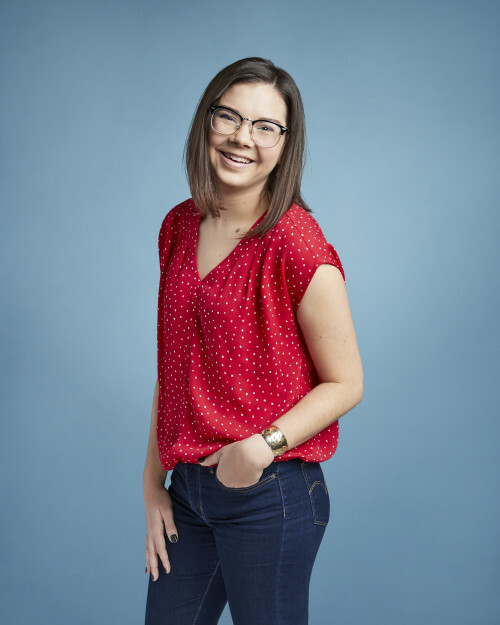 With the next retreat just around the corner, it was the perfect time to sit down and learn more about Haley and the incredible organization she’s a part of. So, what exactly is With a Little Help? It’s a non-profit that was started in the early ’80s. The Muscular Dystrophy Association puts on a kids camp every year that you can go to until you’re 17. The founders of With a Little Help realized they didn’t want to stop going, so they created an organization for adults. A camp is held every year at a fully accessible location called Camp Wawbeek in the Wisconsin Dells. We really strive to provide a week out of the year where everyone can be themselves. We provide lots of recreational activities like swimming and trail rides as well as plenty of networking opportunities. What’s your best memory from camp? I’ve been going to camp forever. I still go camping with a lot of the same people I started at the kid camps with. It’s not necessarily a memory, but with camp, I’ve gained a second family and a support group. It’s cool to see volunteers come not really knowing what they’re getting into, and then see them return year after year. With counselors and campers combined, we have about 80 people, and I would love to see that continue to grow. How did you become President of With a Little Help? I have been on the Board of Directors for 3 years. I started as a Secretary but hated taking notes. Then, I was nominated for President. I’m the youngest person on the board, so I’m striving to gain membership through social media. We didn’t have an Instagram account until two months ago, so it’s a huge opportunity and area of growth. In addition to that, we have five main goals: sending reminders, raising hype about the camp, getting more campers and volunteers, spreading awareness about Muscular Dystrophy and highlighting members that are doing awesome things. Born and raised in Wisconsin, it was a no-brainer for Sophie to name her adventure-seeking blog My Sconnie Life. Always dreaming of food, more food, and her next weekend getaway, she’s constantly seeking all things unique and loves to support small businesses along the way. Take one look at her envy-inducing Instagram and trust us, you’ll be craving a tasty treat or booking your next trip in a matter of seconds. Lucky for us, she’s always recommending her favorite spots and sharing inspiring photos along the way. What gave you the idea to start your own blog? After graduating from college and starting my job, I wanted a creative outlet. In January of 2017, I started my blog and chose to focus on mostly food with a dabble of travel. I really love exploring new restaurants and businesses in Milwaukee as well as other cities. You’ve done some cool collaborations. How did you come across those opportunities? City Tins and JettSet Local are both Milwaukee companies that get you food and drink deals around MKE. City Tins reached out to me to create a partnership, but I actually reached out to JettSet Local. I was interested in what they were doing and wanted to be a part of it. It’s been fun to work with both organizations and get to know other Milwaukee food lovers along the way. What would you tell someone who’s looking to start their own blog? Whatever you want to do, do it for yourself and not to get likes or gain followers. If you make it about that, you may lose your passion for it. It’s easy to get wrapped up in the double taps and waiting for that number to climb, but as long as you enjoy what you’re doing, that’s what matters. Also, eat all the food! Life is too short not to get those tasty fries! For the past 4 years, Lindsay has been honing her skills for all things hand-lettered. Growing up, she would catch herself doodling in class and eventually became fascinated with watching slo-mo lettering videos on Instagram (we have to admit, they’re addicting). Fun fact: she has an obsession with really good pens and hides her favorites in a secret stash so they’re safe from the pen-borrowers of the world. We caught up with her to learn a little more about how her hobby turned into a passion project. How did you get into calligraphy? A friend of mine was getting married and needed help bringing some of her Pinterest visions to life. I started with addressing the invitations and it stemmed from there. I ended up working on all sorts of things for her big day. After that, I just stuck with it and branched out to working on lots of miscellaneous projects. What are your favorite kinds of projects to work on? I really love hand addressing envelopes. It’s fun to play with different styles and designs. Not to mention, it’s a great opportunity to throw on a good podcast while I work. I think my favorite project I’ve ever done was a Disney Scavenger Hunt for my sister’s bachelorette party. I’d never done anything like that before, and it was exciting to step out of my comfort zone. It’s also great that I’m able to share my passion through projects at Wantable. I’ve been able to create custom canvases at an MKE Moms Blog Event and even make props for social media photos. Do you do everything freehand? No way! That’s too much pressure. Even if it’s a large paint project, I always trace it out in pencil first. Also, if it’s not something that has to be handwritten, I love working on my iPad. It’s so easy to move things around and fix any mistakes. Plus, it’s definitely a bonus to be able to print multiples of everything instead of doing them all individually. Even before starting her own family, Kayla has always had a special place in her heart for taking care of little ones. When she signed up to volunteer at the Aurora Sinai Medical Center in the NICU department, she had no idea her sweet little Cora would soon be in her life. After several months, she was finally moved off of the extensive waitlist. But between balancing a full-time job and having a baby at home, she almost passed up on the opportunity. We sat down with her to hear about what changed her mind and about her powerful impact in the NICU. What does volunteering at the NICU entail? The primary purpose of NICU volunteers is to hold babies in need of some extra love and attention, especially those struggling with NAS (neonatal abstinence syndrome) from opioid addiction. Nurses are assigned to more than one baby at a time, so they’re always happy to have extra help to comfort a fussy baby while they’re tending to another. We also help restock supplies, wipe down equipment, fold baby clothes, get water for the families and color pictures to decorate the nurseries. How did you decide that you wanted to volunteer at the NICU? The waiting list for NICU volunteers is usually fairly long, so I actually signed up around the time my husband I were thinking about starting a family as a way to calm my baby fever. Once Cora was born, I almost said “no” when I found out I had been moved off of the waitlist. Then I thought about how I would have felt if she had been in the NICU and I wasn’t able to be with her all the time. I would have wanted someone to hold her and give her comfort and love when I couldn’t be there. What are some of the challenges that you face? While my attention is fully on providing comfort to the babies, I wish I could do more for their families. They’re going through such a difficult time. Many of them are juggling work, family and other obligations in addition to trying to spend as much time as possible with their baby. Who inspires you? What have they taught you about strength, creativity or supporting their community? Share their story in the comments below! Hey, hi, hello there! You may have found yourself here because you’re curious about the shoes you see styled with our favorite outfits on social media. We love that you ask about them and leave heart eye emojis for your favorite pairs–we’re obsessed, too! While Wantable doesn’t currently carry footwear (yet), we love a good pair of shoes just as much as you do. We know that they’re essential when pulling together a great ensemble, so we wanted to put our best foot forward and share a bit about why we look to them as an important part of telling our style story. Our goal at Wantable is to inspire you, and we believe a big part of that is showcasing looks completely styled from head to toe. For that reason, almost all the outfits you see in our social feeds include the perfect pair of shoes for that look. While we love showcasing the awesome bags and jewelry available in our Edits as well as playing with props, there’s just something about the right pair of shoes that can totally transform an outfit. Who knew shoes held so much power?! (Okay, maybe we did—they’re pretty magical.) We spoke to a few of our expert Wantable Stylists to see what their go-to kicks are, and it turns out they have a few favorite brands they’re all swooning over. Aldo: Fashion-forward shoes with a modern flair. Asos: A one-stop-shop for all of your favorite brands (and then some). Converse: Iconic and timeless sneakers driven by self-expression. Keds: Run-the-world kind of shoes that have been putting ladies first since 1916. Nine West: Cutting edge shoes from a brand that celebrates the spirit and strength of women. Target: We especially love their collaboration with Dolce Vita, DV, and in-house brand, A New Day. Toms: Known for their slip-ons, each pair purchased gives back, supporting a variety of incredible causes. Allbirds: Comfortable, simple, and sustainable shoes crafted from Mother Nature’s materials. Birkenstock: Premium (and currently trendy) comfort sandals with a heritage of quality construction. Dolce Vita: Ultra-cool designs providing non-stop style inspiration. J/Slides: Effortless casual footwear, inspired by NYC street style. Frye: Upscale leather footwear that is durable, timeless and authentic. M. Gemi: Premium leather shoes, handmade in Italy at accessible prices. Nisolo: Modern handcrafted styles made ethically and sustainably. Rothy’s: Washable, woven flats made from recycled plastic. Sam Edelman: Unique styles inspired by timeless favorites. Seychelles: Vintage-inspired designs with a modern twist. Sperry: Shoes inspired by prep heritage with comfortable tried-and-true construction. Pro tip: selecting the right shoe can make or break your outfit. Here’s an inside look at how our Stylists do it. Pointy-toed flats are a guaranteed way to keep your ensemble looking professional and polished. Not to mention, no heel means they’re perfect for non-stop days filled with meetings and errands. Distressed denim and comfy sneaks? Yes, please. A good slip-on sneaker paired with relaxed jeans and a cool jacket creates a completely effortless look and is a great place to add a pop of pattern. A timeless Chelsea boot is at the top of our list of shoes you should invest in. They’re a style chameleon and can pair with literally everything. If you’re stuck on which shoe to finish your outfit with, here’s the answer. A classic white sneaker is a closet must-have. Paired with boyfriend jeans, a utility jacket, and a comfy sweater or hoodie, this casual outfit is ready for low-key plans. White sneakers are a shoe-in (see what we did there?) for jeans and joggers, but we also love to pair them with dresses and skirts for an instant street-savvy look. A low-heeled strappy sandal is our pick when we’re looking for the perfect balance of casual and elevated style. A chunkier heel provides all-day support and takes your outfit to the next level without having to go full-blown pump. Comfort and style? Winner, winner. Okay, honestly a strappy black heel is the shoe of our dreams. They instantly add an air of sophistication no matter where you’re headed, and we love that they’re no longer reserved for dressed up occasions anymore. They work with any outfit from a graphic tee and jeans—to a cocktail dress—and everything in between. Your positive feedback, questions and requests have not gone unnoticed, and we’d love to hear more about what you think. Would you like to see shoes included in our Style Edits, Fitness Edits or Men’s Fitness Edits in the future? What brands do you love? How much do you prefer to spend? We’re dying to know! Share your thoughts in the comments below. Classic blue jeans are a wardrobe staple that we’ll never deprive our closet of. We’re a blue-jeaned baby at heart (please excuse us while we go sing our best rendition of Tiny Dancer), but we’re itching to ditch the dark hues for fresh, spring-inspired pairs. Our insider secret? Our stylists are trading in traditional for daring, and we’re 100% here for it. 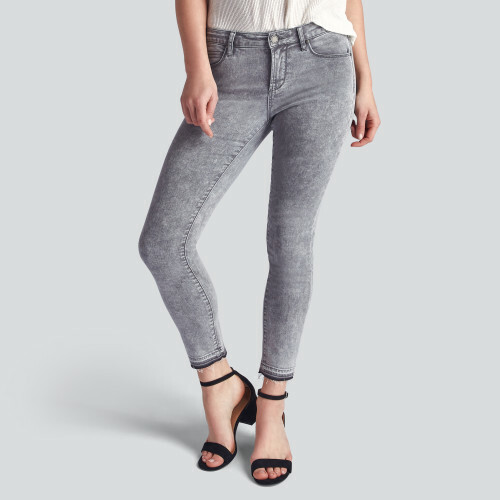 Whether you’re looking to switch up your off-duty denim or need a new office-appropriate pair, we’ve got you covered with the top denim trends to invest in this season. Oh, white denim. We’re so thankful that we get to wear you year round. If you’ve been sporting them throughout winter in a warm cream hue, it’s time to brighten it up with a crisp white. Pair them with stripes for a slightly nautical feel, or, if you want to try out a street-savvy style, go head-to-toe white. Whether you opt for the same exact shade or a mix of similar hues, a monochromatic ensemble is sure to turn heads–and that’s a look we can get behind. For spring, there’s a kaleidoscope of colors to choose from when it comes to denim–purples, yellows, reds, and greens are especially prominent. 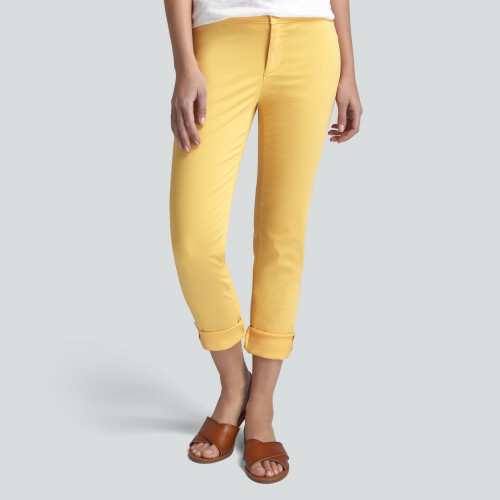 What we’re most excited about is that your colored denim doesn’t have to be paired with basic pieces. Adding a print or mixing different colors (whether they’re in the same color family or not) will give your ensemble a truly modern feel. Okay, so maybe we lied. 😬 (We just can’t quit you, blue jeans!) 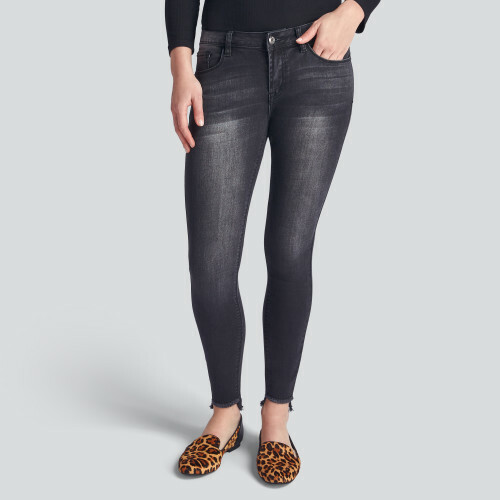 But while you don’t have to give them up completely, we’re seeing a strong shift towards a faded straight-leg instead of the deep indigo skinny that’s been a mainstay in past seasons. We love the nod to the nineties and are crazy about all of the different options out there. Don’t be afraid to play with the hemline a bit. Try out a step-hem, a raw hem, or even a two-toned hem to give your look some personality. For many of you, spring break is the highlight of the season. It’s the first time in forever that you’re able to thaw out and take a break from the norm. With so many places to choose from, there’s no doubt that packing lists vary depending on the destination. But, if there’s one thing we think deserves a spot on everybody’s spring break packing list, it’s denim. 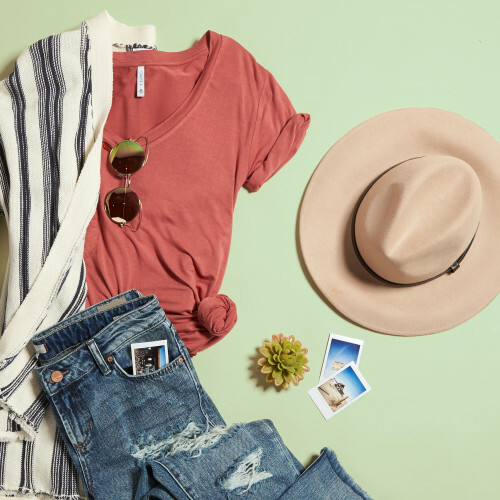 Nothing says “relaxed and unplugged” quite like a good pair of denim, so we’ve rounded up the perfect pieces no matter where you’re headed along with our go-to spots on where to grub and explore. Warning: travel bug highly contagious. Ah, we can smell a hint of coconut now. If you’re looking for a good balance of relaxation and adventure, Sarasota is a no-brainer. Whether you’re looking to sip umbrella drinks on the sand (keep ’em comin’ 🍹) or explore your surroundings, there’s a little bit of something for everybody. 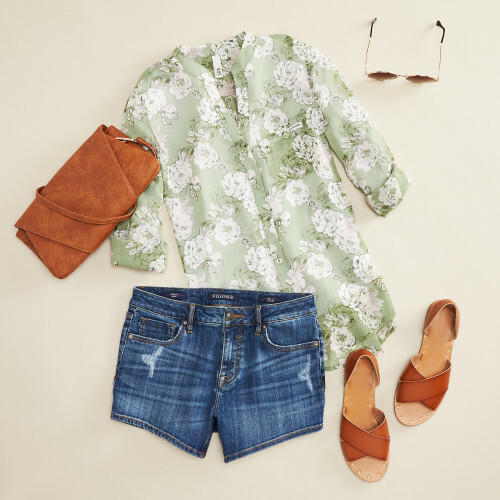 wear this: Denim shorts are essential for your spring break packing list if you’re heading to Florida, but we especially love a crisp white pair. They’re the perfect piece to throw over your swimsuit or pair with a flowy blouse for a beachside dinner. Don’t forget your sunscreen and beach towel! do that: Located on the Golf Coast, there are plenty of gorgeous beaches to choose from in Sarasota. Gather a group for some sand volleyball, pack your favorite books, or simply get some shut-eye in the sun. If you’re looking to explore the water, a kayak tour will allow you to experience things that you can’t by foot–you may even see some sea creatures! This location was chosen with the adventurer in mind. With some locations in the valley accessible only by Jeep (or something equivalent), you’ve gotta love the journey as much as the destination. Abandoned towns and scenic drives will provide plenty of Insta-worthy moments. wear this: Boyfriend jeans are key when you’re roaming around the desert. Their loose fit will allow you to move around easily, and a distressed pair will especially come in handy to allow for more breathability. We’re loving the look finished with a wide-brimmed hat. It fits right in with the boho vibe and also offers protection from the sun. do that: In addition to checking out highly recommended spots like Badwater Basin, we suggest exploring the various ghost towns or driving through Titus Canyon. The average time to hit all the highlights in Death Valley is 2 days, so when you’re finished touring the national park (or just need a break from a remote setting), you can head to Las Vegas which is only two hours away. Southern charm combined with excellent shopping, floppy hats, and outdoor brunch spots makes Charleston the perfect destination for a girls trip. Darling local business and beautiful ocean views will make you question whether you’ll actually head back home. wear this: A denim jacket is the perfect layer to accommodate fluctuating temperatures. Drape it over your sundress or layer over a tee and chinos. Be sure to pack some comfortable shoes. A thick heel will keep you steady on those old-timey streets while providing plenty of support for your feet. Finish your look with some freshly picked flowers from the farmers market–you’ll look like a local! do that: We highly recommend checking out the local farmers markets. You’ll find plenty of cool vendors and maybe even get some free samples (score). If you’ve never been, renting a bike is a great way to see the city. It’ll get you from point A-to-B faster and you’ll be able to fit more into your day. If you’re looking for something a little quirky, our top pick is New Orleans. The best part about NOLA is that there’s an activity for any kind of traveler. You can do anything from alligator-spotting on a swamp tour to indulging in the food to immersing yourself in the curiosities of the city. wear this: Try out some distressed dark denim for your trip to New Orleans. A pair with a raw hemline and straight silhouette will exude a care-free attitude perfect for all of the exploring you’ll be doing. You’ll see plenty of sun on the gulf coast, so wear a peasant blouse and open-toed shoes to keep you cool. do that: Start your day with a Bellini and beignet and head off to the Garden District or take a stroll down Magazine Street. At night, you can check out a historic cemetery or sign up for a walking ghost tour. 👻 If spooky things aren’t up your alley, you can always hit up a legendary live music venue or explore the local art scene. There’s something so appealing about transitioning into a spring wardrobe. Pretty florals, fresh colors, and lighter clothing are all a much-needed change after a few months of muted tones and heavy knits. But, seeing as it’s only February, it may be a bit before we can fully pack up our winter wardrobe. (After all, most of us are still recovering from the polar vortex.) To be honest, this time of year is a little awkward. You’re probably tired of heavy layering, but it’s not quite warm enough for spring pieces – ugh. We’re here to help you nail the transition from winter to spring with a few easy-to-replicate outfit ideas. Ever since neon made a comeback last fall, it’s been the most anticipated trend of 2019. If you’re neutral about neon, don’t fret. 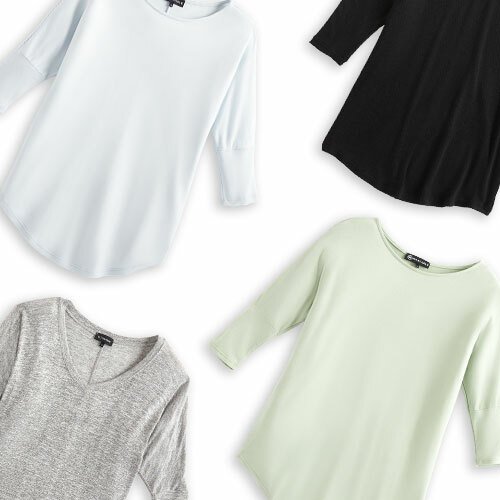 Brightening up your wardrobe doesn’t have to happen overnight. 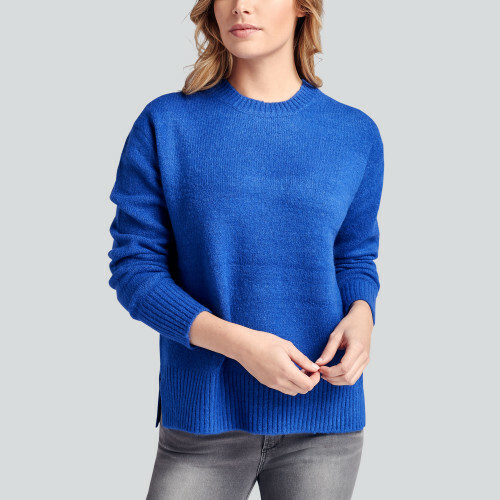 Try out the trend in a pullover sweater or your accessories to get a feel for it. Who knows, you may be obsessed with the trend after you wear in small doses (guilty). Paired with cool tones like grey (a winter staple), it’s a fail-proof combo that makes for the perfect transitional spring outfit. 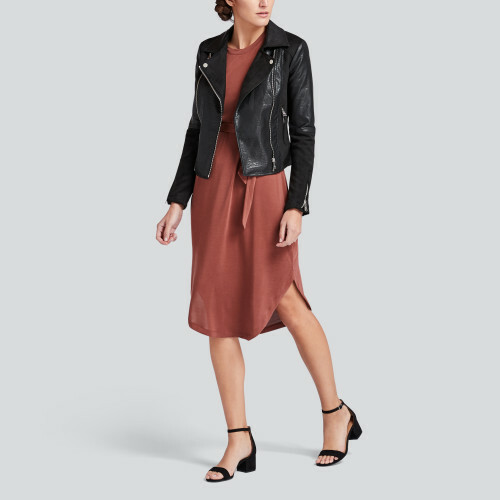 A heavy-weight moto jacket paired with a light chiffon dress is a winning combo for transitioning your winter wardrobe into spring. 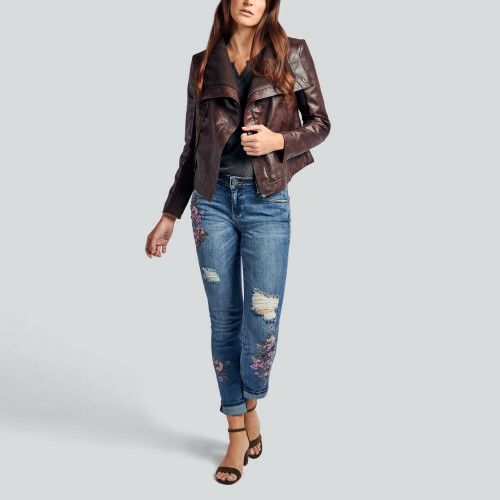 A faux suede jacket or sherpa lined denim could also make for the perfect frock topper – just pick whatever suits your style. Finish your ensemble with over-the-knee boots on chilly days or ankle booties when those spring temperatures finally stop by to say hi. This season, we’re seeing pants show up in all sorts of colors. Yellow, lilac, green, you name it. We love that you can pair them with the most neutral of pieces and your outfit will still feel all sorts of spring. The perfect finishing touch? A classic trench coat. Its long length makes it great for layering and you can still add your favorite winter accessories to keep warm. 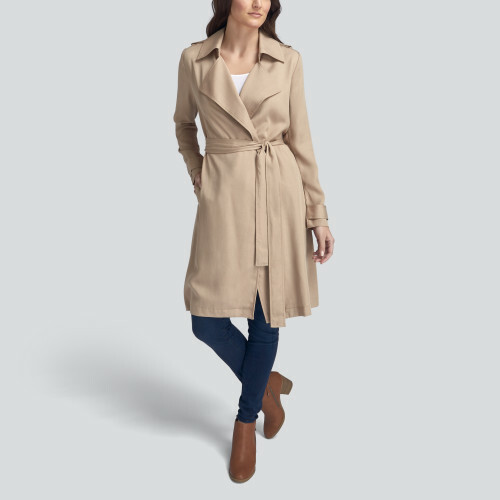 Our bets are on the trench coat as the must-have piece for spring, so you may as well snag one early. Transitioning your denim into spring can mean a few things. The obvious choice is to lighten the wash or bring the hem up a bit, but we like to take it to the next level by adding spring-inspired embellishments. Much like our friend neon, embroidery is a highly anticipated trend for not only spring but all of 2019. We love mixing a vintage silhouette with floral accents for a match made in denim heaven. An easy way to freshen up your look is by taking your favorite winter silhouettes and trying them out in lighter colors. 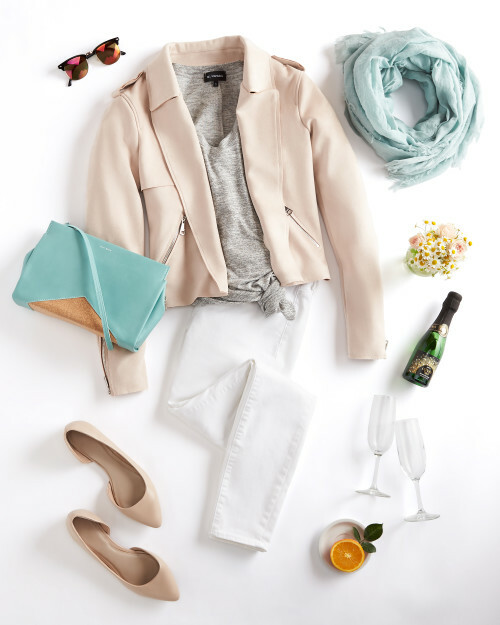 A jacket in a blush or cream hue instantly brightens up your look and will still ward off any unwanted chill. Layered over a casual tee and paired with the dark distressed denim you’ve been rocking all winter long, your whole outfit will feel effortless and street-savvy. Pro Tip: Add animal print accessories for a totally on-trend look.